Frank Zappa’s collection of Crowleyana and other occult books are up for auction – Zero Equals Two! 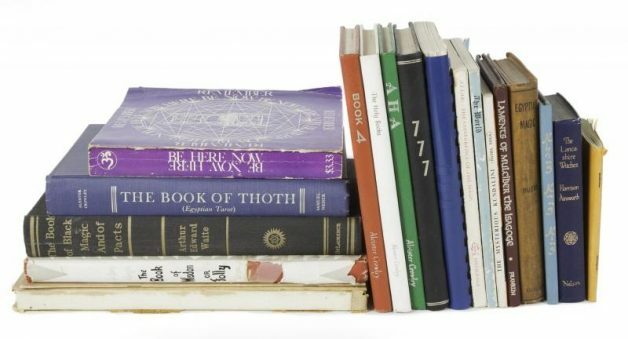 A tasty collection of occult books previously owned by Frank and Gail Zappa–mostly from the 1960s and 1970s–is coming up for auction at Julien’s Auctions on November 4, 2016. Rarities in this lot include a first edition of Aleister Crowley’s Liber Aleph (1962, with a presentation inscription to Frank Zappa…not by AC of course) and C. F. Russell’s Znuz Is Znees (1970). The inscription in Liber Aleph reads, “To Frank, I would be a slave to the slave, of your genius, neither tempting, nor restricting. You are, by far, the brightest star. No shadows shall remain.” The presenter is unidentified in the catalog. Other Crowley titles recognizable in the auction photo include a Samuel Weiser hardcover edition of The Book of Thoth (minus the dust jacket), Thelema Publications’ edition of Khing Kang King, a facsimile reprint of the second edition of 777, and a smattering of titles by the Sangreal Foundation: Book 4, The Holy Books, and Aha. There’s also a DeLaurence reprint of A. E. Waite’s The Book of Black Magic and of Pacts, the book whose description of an invisible college prompted a young Aleister Crowley to write to the author for more information and seek this invisible college. A collection of esoteric philosophy books previously owned by Frank and Gail Zappa, including Znuz is Znees: Memoirs of a Magician by C.F. Russell (self published, 1970); The Book of Wisdom or Folly, in the Form of an Epistle of 666 the Great and Wild Beast to His Son 777…by Aleister Crowley (West Point, CA: Thelema Publishing, 1962) with an inscription in blue ink to the prelim “To Frank, I would be a slave to the slave, of your genius, neither tempting, nor restricting. You are, by far, the brightest star. No shadows shall remain”; Satanism in America by Shawn Carlson and Gerald Larue (El Cerrito, CA: Gaia Press, 1989) with a typed letter to Frank Zappa on Satanism in America letterhead, suggesting the book may be of use in Zappa’s fight against music censorship, signed by the author; and Laments of Mulciber the Isagoge by Benjamin A. Franklin (Detroit: Society of the Isagoge, 1973) inscribed in black ink to the front endpaper “To Frank, from Andrew Flame…the Lucifer”. The opening bid was $250, with the lot expected to sell for $500-$700. As of this writing, the current bid is $2,000. For those who are interested in the life, music and legacy of Frank Zappa, the auction includes many of his other possessions, from comic books and his lunch box collection to musical instruments and recording equipment.